Vande Mataram was originally written by Bankim Chandra Chattopadhyay as part of his novel ‘Anandamath’ in the year 1882. One of the sticking issues in the secular-communal debate in Independent India has been regarding the singing of Vande Mataram which happens to be the national song of India, a country comprising of a strong 1.28 billion people. Vande Mataram was originally written by Bankim Chandra Chattopadhyay as a part of his novel ‘Anandamath’ in the year 1882. The song generated massive controversy during the 1930s when India’s movement for independence against the British was beginning to take a decisive note. The Muslims of India raised objections concerning the lyrics of the song which they considered to be sectarian and idolatrous. Ever since then, Vande Mataram has been an issue which has managed to polarize Hindus and Muslims of India. The debate has got murkier with the some Sikh and Christian organizations joining the anti-Vande Mataram bandwagon. Since the Muslim groups have historically been most vociferous in their opposition to Vande Mataram, it becomes imperative to first analyze the objections raised by them. The first and most fundamental objection is in regards to the meaning of the term ‘Vande’ which Sri Aurobindo, a Hindu revivalist scholar, translated as ‘Mother, I bow to thee’ in his translation of Vande Mataram. While some sects among Muslims might be seen occasionally prostrating before shrines, the majority theological opinion among Muslims is that their religion does not allow them to bow in front of anyone except Allah. The second and the more serious objection is in regards to the sectarian nature of the song. While the third stanza possibly refers to Hindu Goddess Kali, the fourth stanza mentions the Hindu Goddess Durga by name. Metaphorically, the poem identifies the Land of Bengal with Hindu Goddesses. The third objection concerns ‘Anandamath’, the novel in which Vande Mataram appeared for the first time. The novel revolves around the Sanyasi Rebellion which took place against the Muslim Sultanate in Bengal during the late 18th century. Some have claimed that the novel endorses the idea of Hindu nationalism and portrays Muslims in bad light. In January 1999 issue of English magazine Frontline, AG Noorani wrote an article titled, ‘How secular is Vande Mataram?’ in which he pointed out towards certain sections of the novel which appear to be anti-Muslim. He stated that in the last chapter of the novel, Satyananda, the protagonist of the story, is persuaded by a supernatural figure to bring a halt to fighting as Muslim dominance in Bengal had been destroyed. The supernatural figure tells Satyananda that the British would now rule over them and they were their (Hindus) friends and could not be defeated in battle. While the Congress did make substantial adjustments in regards to Vande Mataram, the stand taken by them was not enough to please the Muslims as they still objected to the use of the word ‘Vande’ whose meaning by now had become a bit ambiguous. 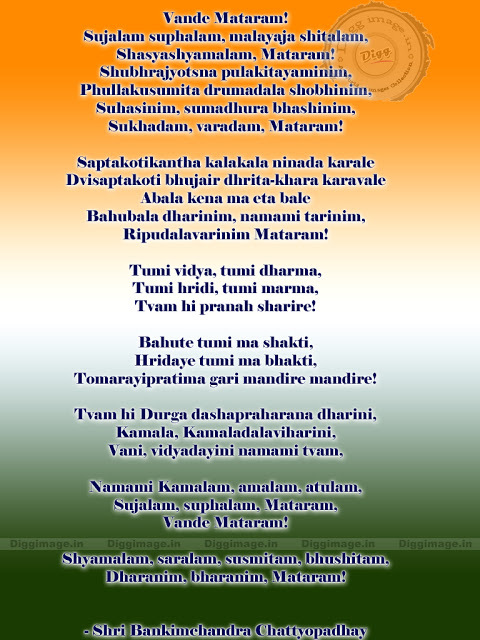 In a letter written by Rabindra Nath Tagore to Subhash Cahndra Bose, he stated, “The core of Vande Mataram is a hymn to Goddess Durga: this is so plane that there can be no debate about it. Of course Bankimchandra does show Durga to be inseparably united with Bengal in the end, but no Mussalman can be expected patriotically to worship the ten handed deity as Swadesh. This year many of the special Puja numbers of our magazines have quoted verses from Vande Mataram – proof that the editors take the song to be a hymn to Durga. The novel Anandamath is a work of literature and so the song is appropriate in it. But Parliament is a place of union for all religious groups and there the song cannot be appropriate. When Bengali Mussalmans show signs of stubborn fanaticism, we regard these as intolerable. When we too copy them and make unreasonable demands, it will be self defeating.” Mahatma Gandhi advised the Muslims of India to appreciate the historical significance of Vande Mataram but warned against mandatory imposition of the song on them. The most important question is can singing of Vande Mataram be made compulsory for all? The plain and simple answer is no! In the year 1985, a school in Kerala expelled students belonging to the Christian sect of Jehovah’s Witnesses for not singing the National Anthem, ‘Jana Gana Mana’. The father of the children, Bijoe Emmanuel, took the matter to court. Eventually, the Supreme Court ruled in favour of the children’s right to not sing the national anthem. The Supreme Court stated, “The Fundamental Rights of the appellants under Art. 19(1) (a) and 25(1) have been infringed and they are entitled to be protected. The expulsion of the three children from the school for the reason that because of their conscientiously held religious faith, they do not join the singing of the National Anthem in the morning assembly though they do stand respectfully when the National Anthem is sung, is a violation of the fundamental right to freedom of conscience and freely to profess, practice and propagate religion. Therefore, the judgment of the High Court is set aside and the respondent authorities are directed to re- admit the children into the school, to permit them to pursue their studies without hindrance and to facilitate the pursuit of their studies by giving them the necessary facilities.” The Supreme Court further added, “There is no provision of law which obliges anyone to sing the National Anthem nor is it disrespectful to the National Anthem if a person who stands up respectfully when the National Anthem is sung does not join the singing. Proper respect is shown to the National Anthem by standing up when the National Anthem is sung. It will not be right to say that disrespect is shown by not joining in the singing. Standing up respectfully when the National Anthem is sung but not singing oneself clearly does not either prevent the singing of the National Anthem or cause disturbance to an assembly engaged in such singing so as to constitute the offence mentioned in s. 3 of the Prevention of Insults to National Honour Act.” It was possibly because of this court judgement that Former India Prime Minister Atal Bihari Vajpayee clarified regarding the singing of Vande Mataram in the year 1998 and stated that it was not compulsory to sing the song. An important aspect of the Supreme Court’s judgement regarding the right of Jehovah’s Witnesses to not sing the national anthem was that the children never disrespected the song as such and stood up quietly while the song was being sung as a mark of respect. Going by the precedent set by the Supreme Court, no minority group in the nation including Muslims have the right to disparage Vande Mataram as the verdict of the Supreme Court concerning the national anthem can also be extended to the national song. They are not entitled by law to take part in the singing but they are also not supposed to create hindrance while the national song is being sung. Recently BSP Member of Parliament Shafiqur Rehman Burq raised a stir when he walked out from the House when Vande Mataram was being sung. I gave a long thought to the actions of the old man and I have finally come to the conclusion that he didn’t take the right step. If anybody does not want to be a part of the procedure then they should walk out prior to the singing starts. Walking out during the process is going on, can indeed be perceived by many as insulting.